Wow! This event has simply flown by! It's hard to believe that today is our final day for posting reflections. Be sure to head over to Michelle Nero's blog Literacy Learning Zone to link up your post! And we hope you'll join us next week as Donalyn joins in the conversation for a live Twitter chat at 7 p.m. CST. 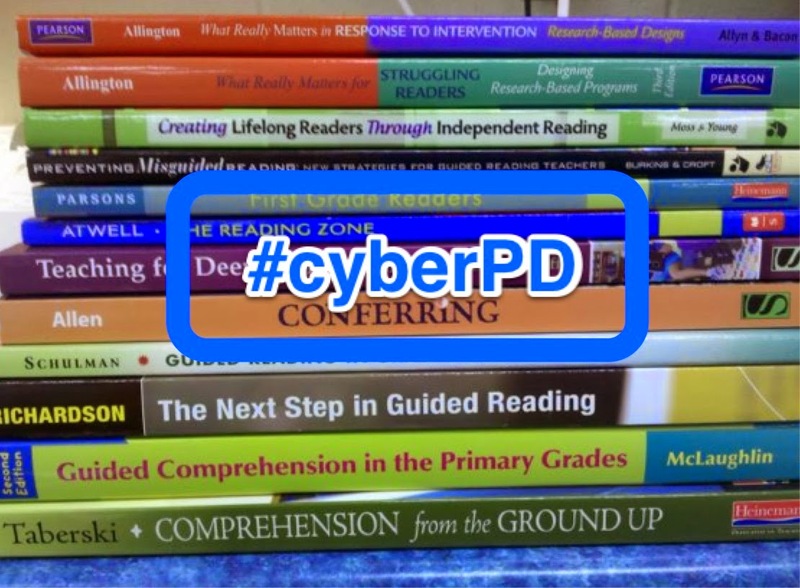 We'll use the #cyberPD hashtag for the chat. My reading tastes are constantly changing. Yes - I do have my favorite genres and authors. But I've found that as my life changes, so do my reading preferences. There was a time when I wasn't able to travel much, so I lived my adventures through travel narratives. Lots of them. I was in a reading funk for a while... and then I discovered paranormal romances. Quality literature? Some of it. Did it pull me in as a reader? Absolutely. I read just about every vampire, werewolf, werecat, and draki book I could get my hands on! Nowadays, I find myself reading as many middle grade novels as I can so that I am a better member of my 4th graders' reading community. On page 166, Donalyn reveals the preferences that students in her classroom identified. My 4th graders definitely echoed those preferences as well! By far, the most popular genre for my readers this year was fantasy. I found myself searching (and buying) more new fantasy books more than anything else, except possibly graphic novels. Pages 171-175 were particularly of interest to me! Graphic novels are often discounted as "fluff reading," but they are oftentimes more difficult to truly understand and grasp. Readers must really pay attention to every detail included in the pictures, as well as understand the importance of dialogue. I've found myself turning to graphic novels (both with first graders and now fourth graders) when I'm trying to hook a reader. Because kids see the comic-type format, graphic novels appear to be less intimidating. This past year, my kids devoured the Amulet series! Another target area for me this year will be nonfiction. I am positive that many of my readers would echo Ashley's feelings about nonfiction being all about dead presidents and whales! Looking back, I can count only a small handful of times I book-talked a nonfiction book or expressed my excitement over an informational text I'd read. I'm consciously aware that I need to fix this! The same goes for poetry. I wrote a little about the 40 Book Challenge in a post last summer, but I've really been rethinking a lot about the freedom I gave my kids this year. I didn't have any genre requirements for them, but I did give some suggestions. After rereading Donalyn's thoughts about the 40 book challenge in this chapter, I'm almost positive I need to stick with the 40 books but give some genre requirements. I keep going back to this sentence, "The main reason Susie and I expect students to try a little bit of everything is so that they can find what they like to read." Makes so much sense!! So, I started making a list of all of the forms I loved from the appendices... and then I realized I was pretty much writing every form down. I think the genre graph, reading list, and reading itineraries will be especially helpful in teaching readers about their reading habits and preferences. I'm very curious to see how my new readers would answer the Wild Reader survey!! And then I started reading Appendix E and forced myself to stop when I realized I had already added more than 10 books to my online shopping cart. Spectacular lists of books!! When I first got my copy of the book back in November, I expressed my excitement on Twitter. Donalyn quickly replied and told me I might want to look at page 255. I was absolutely stunned and honored to see my name listed. Donalyn has impacted my teaching in so many ways! I consider myself very blessed to be able to spend time with her a few times a year in real life, as well as connecting on Twitter. Our conversations always inspire me and are filled with laughter! Today - Be sure to add your own link on Michelle's Literacy Learning Zone blog! Welcome back to week two of this year's #cyberPD event! My mind is still on fire from the amazing insights and reflections everyone linked last week on Cathy Mere's blog. If you are participating this week, be sure to scroll to the bottom of this post and insert your post using the InLinkz link. You'll be adding your own link instead of leaving it in the comments section. Comments really help to affirm ideas and push thinking in new directions, so please be sure to leave feedback on at least 3 posts from this week. Sharing our books and our reading is one of the best parts of being wild readers, right? Even if our reading tribe doesn't share our exact book tastes, it's still so much fun to share titles and push each other to read titles we might otherwise skip. As I was reading the beginning of the chapter, I realized that I still have work to do when it comes to fostering a home-school reading community with the families in my classroom. Yes, my parents know I love books, and their children certainly share tidbits with them. But as I continued rereading, I think I need to provide more information to parents about the kinds of reading we do in our classroom and how all reading is valued. Providing more insight to parents will help them understand and support the idea of "reading in the edges" as well. We have a huge responsibility as the lead readers in our classrooms! In a recent conversation with Donalyn, she was saying that we'd never send our children to piano lessons from a teacher who didn't play piano. We wouldn't trust our children to learn from a coach who didn't practice and play the sport being taught. So how is it possible for non-readers to teach reading well? I feel the responsibility for knowing the books my kids are reading. I realize it might be impossible to read each and every book that becomes a part of my classroom library, but I make it my mission to read as many as I can. This helps me with conferring, building relationships, and becoming a member of the reading community in my classroom. On page 107, Donalyn speaks about preserving the dust jackets from hardcover books. As silly as it may seem, I was concerned about this as I began curating my 4th grade library last year. I ended up with a great many hardcover books whose actual covers didn't provide a blurb about the book, so I wanted to make sure to keep those dust jackets. 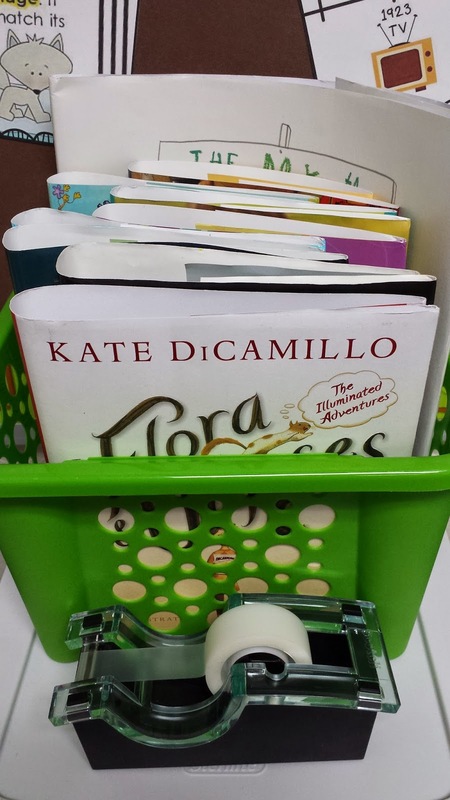 I took Donalyn's suggestion (actually, Katherine Sokolowski first brought it to me after she heard it from Donalyn) to have kids remove the jacket and store it in a basket while they had the book. Very simple, yet it worked beautifully! 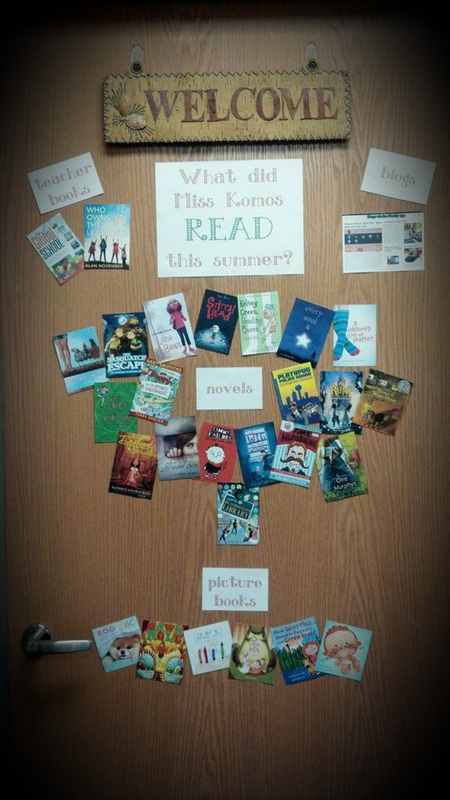 After Donalyn tweeted about her "Reading Life" door last summer, I ran with it and used the idea on my classroom door. My plan is to share my summer reading again to kick off the school year. I'm looking forward to extending this idea and turning the door over to my kids, like Donalyn talks about on pages 116-119. I can't wait to see what they come up with! After rereading The Book Whisperer last summer, I knew I wanted the 40 Book Challenge to become a central part of my 4th grade classroom. I structured it in a very open-ended way this year, but I was still able to use the challenge to have conversations with kids about their reading plans. Donalyn gives some outstanding suggestions in this chapter for ways to nudge students to read more widely! I plan to come back to these ideas as I'm meeting with my readers next year. I first started really thinking about the power of series books when I read Beyond Leveled Books by Franki Sibberson, Karen Szymusiak, and Lisa Koch. At that time, I was teaching first grade but found that even my young readers loved reading books in a series. They felt a sense of accomplishment when they finished all of the Cork & Fuzz books or felt a sense of urgency when waiting for the next Heidi Heckelbeck book to be released. I found the same to be true with my 4th graders this year! Series books and favorite authors often have the power of hooking our reluctant readers. I shared many of the same experiences with series books that Donalyn mentions on page 151 - Nancy Drew, The Hardy Boys, V.C. Andrews. On page 152, I love how Donalyn suggests that kids who read an entire series of books then become epicenter readers for that series. Brilliant - and so true! I'm still pondering the part of chapter 4 that deals with building our own personal reading canon. I have so many books that influenced (and changed) me. I hesitate to make a list for fear of leaving out an important one! One that I know without a doubt will be on my list is Harry Potter. Never in a million years did I think that would be true, but after reading the whole series for the first time this year, I know it belongs on my list. Instead of leaving it in the comments, please be sure to add your link using the blue button below so we can read your thoughts from this week's reading! I couldn't think of a better word to describe my experience at Nerd Camp than joy. Pure joy. Ok, awesomesauce would work, too... but I'll stick with joy. I'm already looking forward to next year's event! Imagine a room full of book nerds, collectively letting out an "oooooooh" as a new book cover is revealed. Shedding a tear when a presenter tells the story of a family outing to get a grandchild's very first library card. 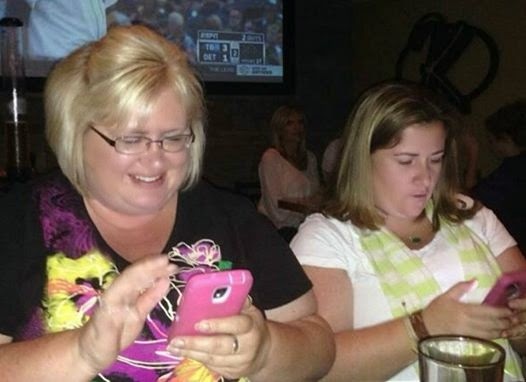 Placing orders from our phones as we chatted about books at dinner. Receiving a bag full of books at registration. Book-loving, smart presenters on day one. EdCamp style on day two with a schedule created and facilitated by attendees. Deep conversations about the need for purposeful tech use in our classrooms. Powerful conversations about remaining grounded in solid pedagogy. Meeting Twitter friends in real life. 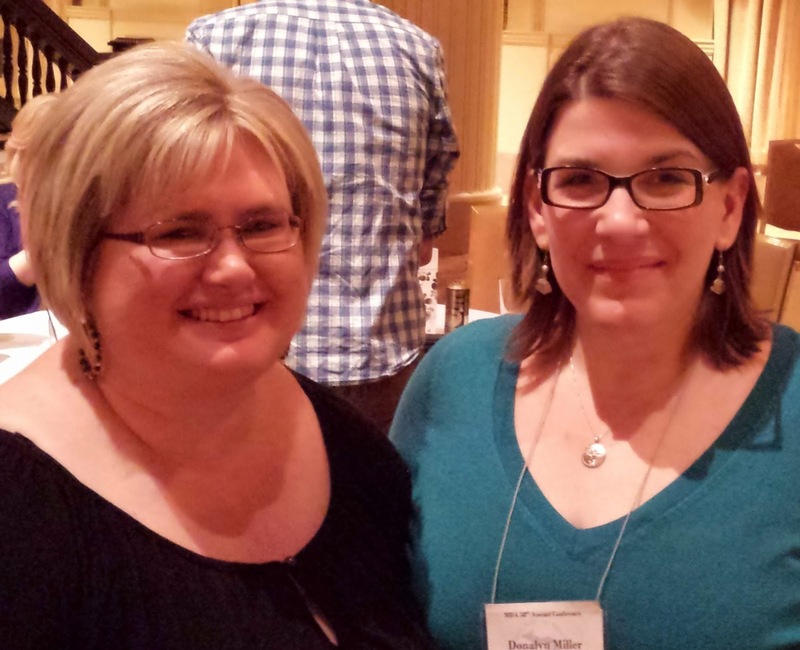 Meeting our rock stars - the authors we love. Sharing our stories, being surrounded by like-minded educators, and pushing our thinking. especially when we can shop for books on our phones!! Franki Sibberson and Gretchen Taylor's session on Small Group Instruction gave me so much to think about! One idea they came back to several times was modern learning spaces. Franki talked about how our spaces should reflect our purpose. For example, she talked about how more informal reading conferences take place around the coffee table in her classroom. This really hit home with me as I've gone back and forth with having a designated "small group" space in my classroom. The trapezoid table I planned to use for small group instruction last year was named the "random table" by my kids and served many different purposes. Franki also spoke about how she plans whole group, small group, and conferences all at the same time and doesn't worry so much about how many times she is meeting with students because she knows their needs are being met throughout the week. I loved how both Gretchen and Franki talked about the flexible grouping that happens in their classrooms; groups are formed for many different reasons and may change often. They urged us to "think about nudges we can give kids." Love this!! Tony Keefer pushed my thinking in his session titled "Are We Climbing the Right Mountain? Purposeful Tech Use in Reading Workshop." When it comes to what we're having kids do during reading workshop, he referred to Donalyn Miller's idea of Language Arts and Crafts and asked if we are now moving to Language Arts and Digital Crafts. Powerful thought. Is the tech we're using truly extending what kids are able to do and how they're able to connect... or is it just fluff? My favorite quote from Tony, referring to tech use, was, "Is the juice worth the squeeze?" This needs to hang in my classroom as a constant reminder for me. He urged us to know what we value to make sure our tech use aligns with it. Absolutely! I love how he focuses on leading kids to living a "readerly life." Such a smart guy! Donalyn Miller's keynote was filled with insight and laughter. Even if you've read her books, you have to make sure you see her in person! She is so down-to-earth, real, funny, and simply brilliant. No matter how many times I talk to her, I always come away with new ideas and books in my shopping cart! During her presentation, she talked more about "reading in the edges." It's so important to talk to our students about this concept. Real readers steal reading time. We may not have a half-hour block of time to dedicate to reading each day, but we can make time by carrying books with us and finding time. We can read while we're at the doctor's office, while we wait in long lines, and while we travel from place to place. 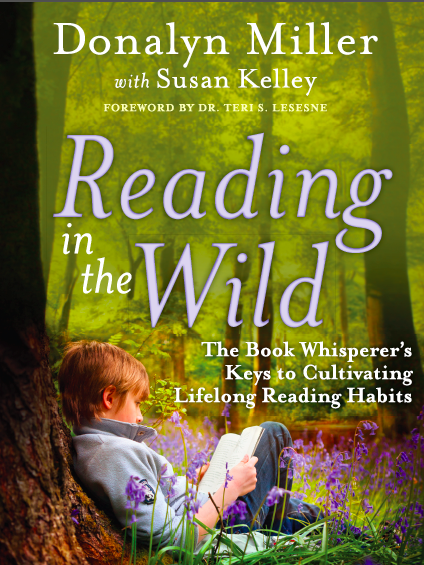 If you haven't read her latest book, Reading in the Wild, I highly recommend it! I attended four spectacular sessions - Genius Hour, Purposeful Tech Use, Choice in Math Workshop, and Math Workshop. This day, I spent time following along on Twitter so I could attend several sessions simultaneously. I also tweeted from the sessions to share what was happening in the sessions I attended. The group notes from each session were particularly helpful!